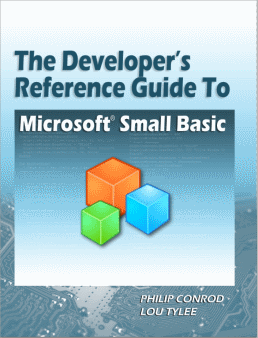 In this chapter, we begin our overview of objects used to build the Small Basic programs. For each object, we summarize the properties, methods and events. Then, we build several example programs illustrating use of the object. 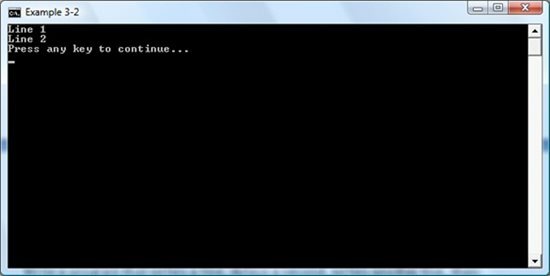 We begin with the Small Basic Program object. The Program object (or more properly class) helps with program execution. We use it identify what folder your program is saved in, implement delays and stop the program. Write a program that displays the directory (folder) your program is stored in. 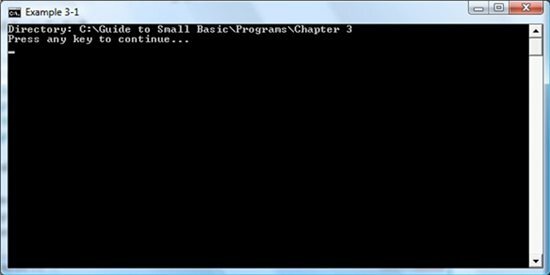 Saved as Example 3-1 in Guide to Small Basic\Programs\Chapter 3 folder. Your directory will be different, assuming you saved your program in a folder of a different name. Write a program that writes a line, delays a second, writes another line, then delays two seconds, before ending. Saved as Example 3-2 in Guide to Small Basic\Programs\Chapter 3 folder. This allows us to see the contents of the window before the program closes. The “Press any key to continue…” statement will not be seen and the text window will close. Repeat Example 3-2, but add an End statement. That is, write a program that writes a line, delays a second, writes another line, then delays two seconds, before ending with an End statement. Saved as Example 3-3 in Guide to Small Basic\Programs\Chapter 3 folder. Save and Run the program. In the text window, you will see Line 1 display, a delay of 1 second (1000 milliseconds), Line 2 display, then a 2 second delay, then the text window will disappear. Use of the Property object. How to identify your program directory. How to implement a program delay. How to stop a program and make the text window disappear. Next, we look in more detail at the TextWindow object we have been using. Small Basic offers a powerful set of methods to work with string type variables, which are very important in Small Basic. These methods are associated with the Text object. MyString = "Small Basic is fun!" LenString will have a value of 19. Characters in the string variable start at index 1 and end at 19. The SubString variable is equal to “mall B” Notice you can use this to extract from 1 to as many characters as you wish. All of our games will be “hosted” by the Small Basic graphics window. To put anything in the graphics window, it must be “drawn” there using one of the many Small Basic graphics methods. Even text has to be drawn! Let’s take a look at these methods. The window is Width pixels wide and Height pixels high. We use two values (coordinates) to identify a single pixel in the window. The x (horizontal) coordinate increases from left to right, starting at 0. The y (vertical) coordinate increases from top to bottom, also starting at 0. Points in the region are referred to by the two coordinates enclosed in parentheses, or (x, y). where Color is the color your pen will draw in and Width is the integer width (a value of 1 by default) of the line (in pixels) drawn. This pen will draw a solid line. To specify a color, you use a color name like “Red”, “White” or “Blue”. Appendix I lists the multitude of colors available with Small Basic. To fill rectangles and ellipses with the current brush color, use the FillRectangle and FillEllipse methods. They have the same arguments as DrawRectangle and DrawEllipse, respectively. In this statement, text represents the string to print in the window and the point (x, y) is where the string will be located. The string will draw in the graphics window using the current brush color using the default font. Note this method uses the brush color, not the pen color – text is truly drawn like other graphics objects. This puts the line “Isn’t Small Basic fun?” at (40, 100) in the graphics window. The text will be blue in color. 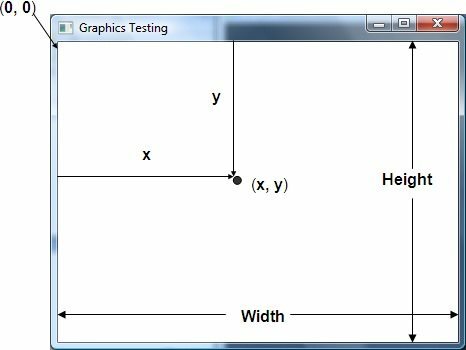 By setting the (x, y) point, you can left or right justify the text, or center it horizontally and/or vertically by knowing the window dimensions. The font size can be changed by setting the FontSize property and FontBold determines if the font is bold or not. Related to graphics methods are Shapesobjects. A Shapes object is a rectangular region we can add, move and remove within the graphics window. Such an object makes animation (moving objects) very simple. We can have shapes that are rectangles, ellipses and even images! Let’s look at each. This will create a ‘bordered’ rectangle. The current pen color and pen width establishes the rectangle’s border color, while the current brush color establishes the fill color. By default, it will be put in the upper left corner of the graphics window. This will create a ‘bordered’ ellipse. The current pen color and pen width establishes the ellipse border color, while the current brush color establishes the fill color. By default, it will be put in the upper left corner of the graphics window. The shape will be placed in the upper left corner of the graphics window. This code will ‘erase’ MyShape at its current position, then ‘redraw’ it at the newly specified position. Successive transfers (or moves) gives the impression of motion, or animation. We will see many examples of using Shapesobjects in the game programs we build. We will provide the image files for any Shapes requiring images. where Arguments represents a comma-delimited list of information needed by MethodName to perform its computation. Once the arguments are supplied to the method it returns a value (ReturnedValue) for use in an application. One set of methods we need are mathematical methods (yes, programming involves math!) Small Basic provides a set of methods that perform tasks such as square roots, trigonometric relationships, and exponential functions. Math.Abs Returns the absolute value of a specified number. Math.Ceiling Gets an integer that is greater than or equal to the specified decimal number. For example, 32.233 will return 33. Math.Cos Returns a value containing the cosine of the specified angle in radians. Math.Floor Gets an integer that is less than or equal to the specified decimal number. For example, 32.233 will return 32. Math.GetDegrees Converts a given angle in radians to degrees. Math.GetRadians Converts a given angle in degrees to radians. Math.Log Gets the logarithm (base 10) value of the given number. Math.Max Returns the larger of two numbers. Math.Min Returns the smaller of two numbers. Math.NaturalLog Gets the natural logarithm value of the given number. Math.Pi A constant that specifies the ratio of the circumference of a circle to its diameter (3.14159265359…). Math.Power Raises a number to a specified power. Math.Remainder Divides the first number by the second and returns the remainder. Math.Round Returns the number nearest the specified value. Math.Sin Returns a value containing the sine of the specified angle in radians. Math.SquareRoot Returns a value specifying the square root of a number. Math.Tan Returns a value containing the tangent of an angle in radians.